In case you didn’t notice, it was Halloween this week. I don’t quite know how I feel about the increasing popularity of this occasion. Most of the time I am just annoyed that all the Halloween stuff in the shops is taking up valuable space that could be given over to Christmas goodies. But my five-year-old son has been talking about Halloween for weeks now, so I felt obliged to make an effort in some way. Which meant that 31st October found us setting off for the mean streets of South London to do a spot of Trick or Treating with some friends. 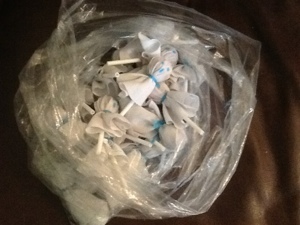 And we took with us my contribution to the pot of treats on offer for callers to their house – Ghost Lollies. I'm not going to spell out how these elements are put together, I'm sure you can work it out! I have to say, they went down a storm. And I know I’m giving you this information a bit late, but if you file this away then maybe next year you too can have the most popular house in the street!